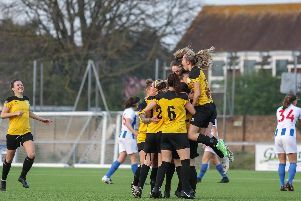 Pagham’s Lions stopped the Lancers’ charge as they won 7-0 to make county cup progress. With the visitors having played in the FA Cup only two days earlier, they fielded a mainly under-23 side, but this takes nothing away from a Pagham goal-spree. It could have been worse for Lancing had it not been for young keeper Jake Gunn, who performed heroics. Goal number one came when ex-Lancing striker Jack Rowe-Hurst set up Callum Overton and Pagham’s leading scorer made no mistake from short range. He could have got a second a few minutes later but was offside. Just after the quarter-hour that the Lions got their second as George Gaskin teed up Overton who scored after a mazy run. Howard Neighbour was clean through on 25 minutes, only to see his strike sail over. Louis Tredea started a fine move for Lancing but the attack broke down. Ryan Cox tried his luck from long range, just missing. Dillon Nagle ran in on goal for Lancing, supplying Finlay Pittock, only for the referee to blow for an infringement. The Lions saw the ball hacked of Lancing’s line as they pressed for a third. After the break, a fine run from Lancing’s Connah Gardner-Lowe should have resulted in their opener. This galvanised the home side, and Neighbour headed home on 54 minutes to make it three. Shay Wiggans and Johann Van Driel were replaced by Shane Brazil and George Cody. Cody almost made an immediate impact with a cross. Gaskin was next on the scoresheet, beating Gunn to make it 4-0 on 66 minutes. A minute later it was five as Rowe-Hurst hit a looping shot over Gunn – against his former club. Just prior to that Gunn had pulled of a pair of tremendous saves. He was beaten again on 72 minutes, Gaskin smacking home. Brazil struck Pagham’s seventh a minute later as a Cody cross was directed beyond Gunn. It could have been eight on 79 minutes, Gaskin with the goal at his mercy, but again Gunn was there to clear. Twice more the Lions hit shots over the bar. Lancing’s Tredea collected a booking for taking out Gaskin. Lancing: Gunn, Law, Pittock, Stevens, Pittock, Butler, Tredea, Meeres, Gardner-Lowe, Smart, Nagle. Subs: Aughertson, Symes, Riches, Wilkinson, Pulling.